Gifted (This post contains products which have been gifted to me for consideration, all thoughts are my own). So often is it that I haven’t written about a particular topic and then two posts come along all at once. It has been a while since I featured hair care products on the blog, apart from the last one. When it comes to beauty, hair is my downfall. I am just no good with it. I wash it with shampoo and condition with, you guessed it, conditioner and that generally is as far as things go. Of course, I also rely on dry shampoo more often than I care to admit. There are a few new products which I have tried to incorporate into my routine, along with two old timers which I think I will be forever repurchasing. The Wet Brush* instantly springs to mind as this is the only hairbrush I now use. The first product is the Batiste Dry Shampoo. It is an old favourite! I repurchase this over and over again and must go through a couple of cans a month. In all honesty, I rarely feature it on my blog anymore, particularly in beauty hauls or similar posts as I feel like I am on repeat. To me, it is the best dry shampoo out there, although I haven’t tried them all. In the past I have picked up other brands to give them a try, however, I always come back to this (I just choose different scents each time). 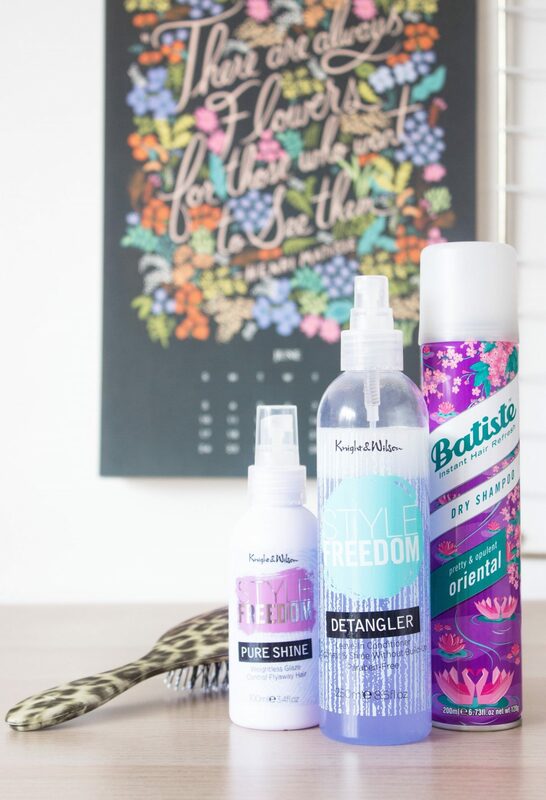 The second product I am reaching for quite regularly now is the Style Freedom Detangler* which I received a little while ago now. I use this when I have washed my hair before I brush it, it is as simple as that. I have no idea in the science behind it and how it actually does make brushing your hair less painful, even when it has been conditioned. Nevertheless, it works and that is good enough for me; I would highly recommend it. Plus, you get a huge amount for your money so it will last you ages. Lastly, the Style Freedom Pure Shine* is perhaps the product that I reach for the least out of all. I am slightly on the fence with this as I like the idea of it, however, I have found that it has left my hair feeling a bit greasy at times. At the moment I am just getting used to testing it out and seeing exactly how much I need to use for it to work on my hair properly; it is currently trial and error. This is a product that is aimed at those with dull and flat hair who want to add shine and combat frizz, so in theory, it should be perfect for me as I often find that my hair looks flat and feels flat. What are your current go to hair products?